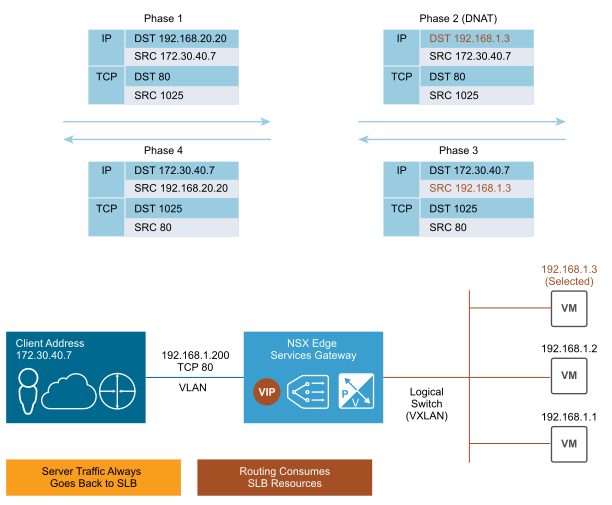 VMware NSX Edge (load balancer) is a solution that provides routing, Firewall, NAT, DHCP, Site to Site VPN, SSL VPN-Plus, Load Balancing, High Availability, syslog for the virtual data center. Physically implemented as a virtual machine, connected to the networks of a virtual data center and to external networks (Internet). Why do i need Load balancer? Load balancer is located between the client and the server farm that receives incoming network and application traffic and distributes it to multiple servers using different methods. By balancing application requests across multiple servers, the load balancer reduces the load on a single server and prevents one application server to become a single point of failure, thereby improving overall application availability and responsiveness. The volumes of traffic are growing, and applications are becoming more complex. Load balancers provide the foundation for building flexible networks that meet growing demands, increasing productivity and security for many types of traffic and services, including applications. Performance measurement was performed in mode firewall accept. 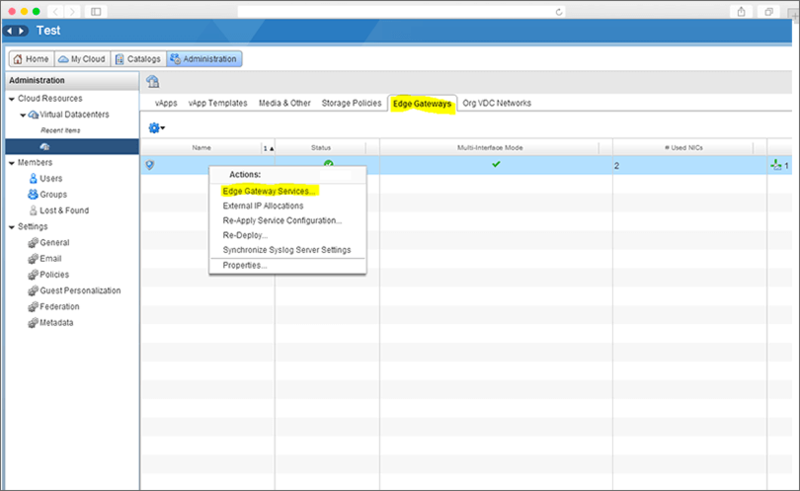 For instructions on configuring the Load Balancer in VMware vCloud Director see knowledge base. Load Balancer Edge (Compact) is free of charge. 1. What's a load balancer for? The load balancer is used to distribute applications' traffic in the servers group so that the new task arrives at the certain server according to the type of balancing. 2. What types of balancing are possible? IP Hash: all requests from the certain IP-address will be forwarded to the predetermined server from the pool. Round Robin: all requests are distributed among the servers in turn depending on the specified weight. URI: all requests to the same address will be forwarded to 1 virtual machine. Applicable only for servers accessible via the protocol http. Least Connected: new request will be sent to the least loaded server. 3. What's your load balancer like? 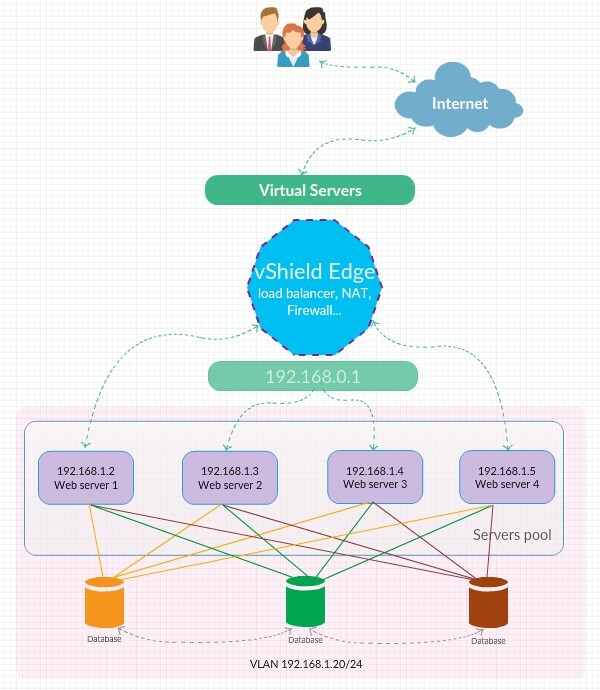 Cloud4Y uses VMware NSX Edge (load balancer) to provide the virtual data-center with routing, Firewall, NAT, DHCP, Site-to-Site VPN, SSL VPN-Plus, Load Balancing, High Availability, syslog. Implemented as a virtual machine connected to the virtual data-center and external networks (the Internet). 4. Under what conditions is the load balancer available? The load balancer is available to all Cloud4Y users free of charge in the EdgeGateway Compact tariff, and it is important that you have at least 2 virtual machines. Attention! VMware recommends using the NSX EdgeGateway at Large level and above for load balancing due to the fact that EDGE Compact may not have enough RAM to store connection history under heavy loads. The EdgeGateway form factor can always be changed to a smaller or larger form factor with no configuration loss and minimal downtime (3-5 minutes). I.e. it is possible to take Compact for testing, and when it becomes insufficient - increase it to Large, then you can return it back to Compact or increase to more powerful Quad-Large or X-large. Comparison of EdgeGateway form factors are in our knowledge base. 5. What other tariffs are there? We have 4 tariffs in total depending on the performance of the load balancer. Find out more about our tariffs at this page. 6. How easy it is to set up your load balancer? Setup takes a little time and to help our users we have detailed instructions in knowledge base. 7. If I can't set up the balancer, can you help me? In this case our engineers can do this, but you need to pay for this service. 1 hour of the engineer's work priced for 1800 publes.